Vampire Home Sweet Home Magnetic Salt & Pepper Shakers  - $12.49 : Mystic Crypt, the most unique, hard to find items at ghoulishly great prices! Vampire Home Sweet Home Magnetic Salt & Pepper Shakers. 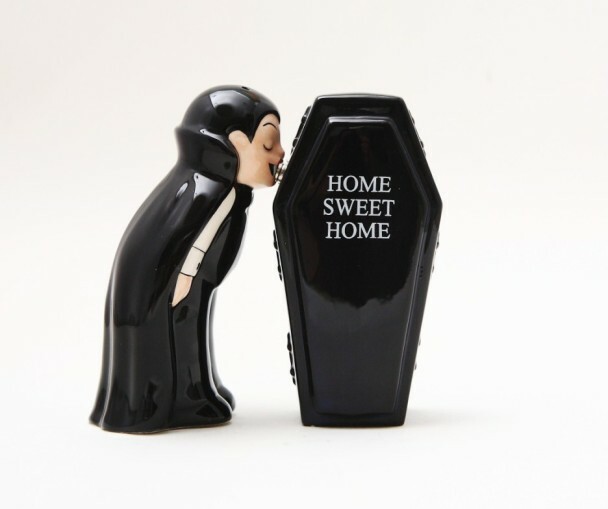 This unique set of salt and pepper shakers features a male vampire kissing a coffin which says Home Sweet Home. A small magnet holds them together. A unique and collectible salt and pepper shaker set from the "Attractives" collection. Measures 3 1/2 inches tall by 3 1/4 inches wide. 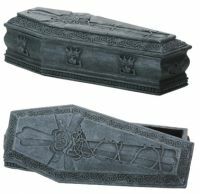 This product was added to our catalog on Saturday 12 November, 2011.